Holistic herbalist Sean McCarthy has always valued green tea for patients for general health improvement as well as specific health challenges. 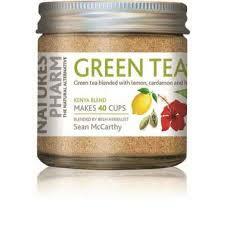 His challenge was to get people to drink green tea and he has achieved that with his powdered instant green tea range. The lemon, organic cardamom and organic hibiscus are perfect for weight loss and detox. The ginseng, organic cardamom and orange will help boost energy when the mid-morning or mid after slump hits while his Relax green tea with passionflower mint and organic hibiscus will do just that if you need to relax or if you find it hard to get to sleep and won't make you drowsy. He also makes a vitamin B complex with L Theanine and Magnesium (from a saltwater source) which is great for Stress/anxiety/PMS and a glucosamine supplement that will help with those aching joints and muscles whether that if from being in the gym or from general wear n tear.